Fifteen years ago, the brothers Robert and Willie Reale, brought to stage a children’s book by Arnold Lobel which had quite a following. The show went to Broadway, where audiences really enjoyed it. So now we have a chance for kids from 4 to 94 to see it staged here. 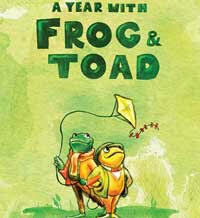 The story is about a Frog (Matt Baum) and a Toad (Greg Hunter) who are friends. They’re hibernating when spring arrives and they get on with doing what amphibians like to do, until Act II when the leaves start to fall and the birds are heading south like many of the older folks. Taryn Janelle and Lyndsay Ricketson are the sprightly birds who get a lot of motion going. They also double as other creatures in some scenes. And Elliott Folds is the third bird who also gets to deliver some snail mail. After all, how many frogs would use a computer? Jenna Tamisiea directed this show which goes through some really cute and funny musical numbers as the frog and toad find their ways through a year. Like humans, they have their good days and not-so-good ones; but as role models for many of us they resolve issues as they experience life. There’s a lesson there for each of us. It’s not about self esteem, as it should be about caring for others as well as ourselves. 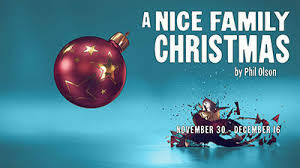 The new City Springs Theatre has brought it’s second Broadway class production to stage, with a large cast, live orchestra, grand set, costumes and dance numbers; in this story about an elf from the North Pole who finds out that he is really a human. 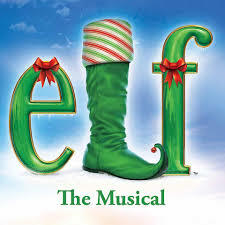 The elf (Shuler Hensley) travels to NYC to find his family and therein lies the story. Elves aren’t that into normal street life, and local folks don’t quite get them. His dad (Steve Hudson) rejects him and has more than enough problems without some elf moving in. His step-mom (Wendy Melkonian) is a little more accepting, considering it is the season to be jolly. Even the young lady, Jovie (Autumn Hurlbert) has trouble accepting this character who really doesn’t have much street creds. It is Christmas time, and the elf winds up getting sucked into helping at Macy’s, where he manages to screw things up big time. Even Santa (Steve Hornibrook) has a problem with this alien mentality. But the half-brother, Michael (Marco Schittone) is more open to this elf named Buddy. The show is a musical directed by Steve Bebout, and Brandt Blocker is in the pit as conductor. There are 16 numbers in the show, but not ones that you will leave the theatre humming. For as the Bard would say, the play’s the thing, and with the holidaze upon us, know that all comes out right in the finale. In fact they come off like the Rockettes as the curtain comes down. This is a new company which is dedicated to bringing first class productions to our community. Next up will be South Pacific in March 2019, and that will be smashing success; especially to those of us who may have seen the original more than 70 years ago. It is brilliant that some of our local theaters now co-produce shows. For the patrons it means they may not have to schlep 20+ miles for a show they wish were closer to home; but for the theatre companies it saves money on sets, costumes, rehearsal dates and more. 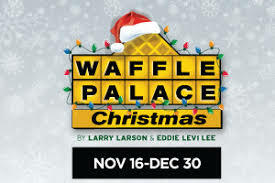 So this high energy show which started in February last year at the Lyric Theatre, then went to Georgia Ensemble Theatre in April 2017; is now brought back by Georgia Ensemble at the Conant Performing Arts Center at Oglethorpe.. Even if you saw it before, you’ll enjoy it once again with some of the same cast. It’s perfect for right now as it exudes energy and you really want to clap, sing, twist and do whatever . . . .
Sun Records had a pretty basic studio in Memphis. It was the birthplace of Rock & Roll, as founder Sam Phillips put out records for several performers who were destined to soar into fame with their Rock and R&B numbers. He was the first to record Elvis and Johnny Cash. This one-act of total excitement is set at the studio. A young piano player wants to get his work out. You’ll thoroughly enjoy seeing Sean McGibbon in his role as Jerry Lee Lewis, and he makes those 88 keys really rock. The show is set on December 4, 1956 when four now-famous players wind up jamming at Sun. Carl Perkins (Christopher Kent) and Johnny Cash (Chris Damiano) show up. Carl isn’t too happy with Jerry Lee as back up. Then Elvis (Alex Canty) drops by with his lady friend, Dyanne (Janine DeMichele Baggett). Sun’s owner, Sam Phillips (Jeremy Wood), has some problems, as some of the guys are going to move on to Columbia Records, regardless that Sam is the one who gave them their first break. The story is about the music, and Sean McGibbon is a hoot on the keyboard, while the other three quartet members really are great on guitars. Dyanne has some numbers to sing, and the gang is backed up by Kroy Presley and James Whitney. Ho, Ho, Ho . . . It’s back again, with Scrooge played to the hilt again by David DeVries, who now owns that role. He never fails to delight. Add to the mix the poor Mr. Fezziwig played once again by Bart Hansard, as well as Joe Knezevich, Andrew Benator, Thomas Neal Ghant and a cast total of more than 20 hard working players in many more roles, live music from Michael Fauss and his two associates, some great evil scenes, and the wonderful set by D. Martyn Bookwalter, and you have a truly incredible presentation. What’s really incredible is that this production which had been done before at the Alliance home stage was being done again at the Cobb Energy Center, to a huge audience who are loving it soooo much. The production is once again directed by Rosemary Newcott. Scrooge could be a poster boy for the non-caring greed which often seems to be prevalent in our society. I doubt it would be very moving for most of the politicians, bankers and lobbyists that we’ve had to listen to for the past few years. In the Victorian era Dickens was railing about the greed which permeated British society. People were sent to work houses and jails when they couldn’t pay a debt. Can recalling events of days past or seeing the unhappy future of persons other than one’s self really provide the epiphany for redemption? It does perhaps bring to mind the comments of George Santayana, who I’ve often quoted, who said “Those who cannot remember the past are condemned to repeat it.” How we see that coming true around the world on a daily basis. Just tune into the news. . . . So much of it as just pure Humbug. There are some scary scenes, especially when the ghost of Christmas future comes to visit Ebenezer. So, if you are thinking of taking the wee ones, make sure it’s a story they know or could handle. Cobb Energy is right near 285 and 75 and easy to get to with plenty of garage parking, and every seat in the house has a good view. A couple of years ago, Paul Conroy delved deeply into the personal and performing history of Ethel Merman. 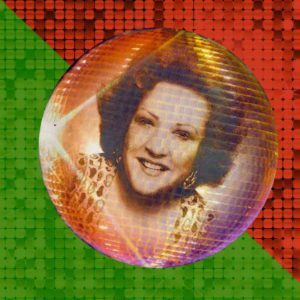 He wrote and directs this play and Nick Silvestri managed the musical arrangements of many oldies that Ethel sings on stage. Ethel Merman, nee Zimmerman, is performed to the hilt by Lynn Grace. Ethel is confronted on many issues by producer/director Isaac Aherns (Rial Ellsworth) and they don’t see things the same way. Ever. Ethel is stage center for this broadcast in front of a live audience. She plays the house in every way. People who knew her might say she wasn’t the nicest of women. She was a potty-mouth, somewhat racist, and totally egocentric. Maybe she could have run for office. In her show she brings on some very high level guests. Davin Allen Grindstaff comes on as Andy Warhol and he is quite an odd chap. But, not quite a odd as Truman Capote (Brandon Deen). And for extra energy she deals with Michael Jackson played by Patrick Coleman. Donna Summer (Alaina Holeman) is supposed to be doing her own numbers, but there’s a clash of egos every time. And Russell Scott plays Jimmy, the assistant and go-fer for Mr. Aherns and Ethel. The show has a cast of thirteen players, six of whom are doing some great dance numbers and the disco costumes might bring you back to the days of your youth in some clubs where you bought a beer even though you were under age. The costumes are terrific, and the play comes off as quite a bit different than one with a red nosed reindeer or somebody yelling Bah! 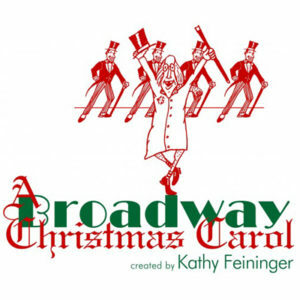 Kathy Feininger, known as the funny Christmas Carol lady, took the old Dickens work and put together a hilarious parody more than ten years ago. Art Station had staged the show some years back; and now they have brought it back center stage; and it is a total romp. 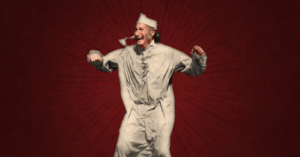 Scrooge (Jeff LeCraw) isn’t the same old geezer you have seen before, but he is still a miserly old character. Except this one can sing and dance, even in his nightshirt. Joy Walters is the female in the cast of three, and she comes on in quite a few personae, including her package as the ghost of Christmas Present. And Ben Thorpe is Bob Cratchit and Tiny Tim. There are also some puppets on stage and the music is provided live by Patrick Hutchison, who also plays off some of the characters, and Thom Jenkins. Thy work through the same old story, but moved along by more than two dozen standard tunes, sung to new parody lyrics that will bring the house down. David Thomas directed this one, and every viewer had a great time. THIS IS ONE YOU DO NOT WANT TO MISS . . . . It isn’t so much for the kiddies; but if you are a grown up and have over-dosed on the same-old, same-old, then this is the one you just gotta see. 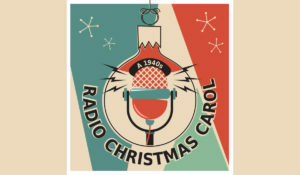 This one is a sequel to the 1940’s Radio Hour, and having some problems radio station WOV is broadcasting live from a little studio in a hotel in Newark, NJ. Clifton Feddington (Russ Ivey) is trying to keep the crew together as they work through a situation where anything which could go wrong does so. They’re going to go on air with an updated version of the classic Dickens work. They’ve brought in a well known stage actor, William St.Claire (Paul Spadafora), who may be OK on stage but has little, or none, experience before a microphone. Buzz (Jake Pearce) is the young lad on the board, who is getting ready to go to war. It is 1943, and the war in Europe is raging, as well as in the Pacific. And, like the Andrews Sisters would have done with a USO Christmas, this cast of 11 players come stage center with many well done numbers. Directed by Jonathan Goff with music by John-Michael d’Haviland, the show runs on a set which works quite well as hotel, studio, bar, control room, etc. And, of course there is a Tiny Tim (Paul Danner) but unlike the usual; not everything comes right in the end. For there is one scene where they spoof about Nazis, and that could be difficult for some older viewers, especially with what is going on these days. They’ve done it again . . .Who else could stage a show with a substantial cast and a full script, and then let different unscripted characters invade the show in each performance. The uninvited visitors are not known to the scripted actors and so once the invasion occurs they have to make up their own story lines and actions to deal with it. And it is a hoot. 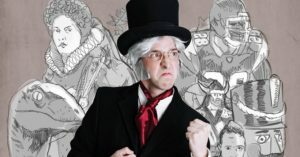 The Scrooge you see isn’t the Scrooge you and your kids know. In fact, this is not for the kiddies, but for open-minded adults who would like an evening of enjoyment with plenty of single entendres. 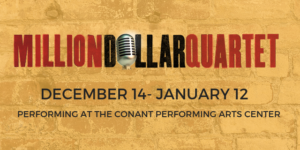 Matt Horgan directs this year’s version which also features various characters played by Andre Castenell, Anna Giles,Liz Grofic, Perry Frost, Clint Sowell, Joshua Quinn and Amanda Lee Williams. Yes, it does have a Tiny Tim and a Fezziwig, and as expected, Scrooge thinks a holiday such as Christmas is a pure humbug. But there’s plenty else that’s new in this one, as the main cast has to improvise to deal with some invader they didn’t know was coming until about 5 minutes before curtain time. Dad’s Garage is located in a former church on Ezzard St, down in the Old Fourth Ward. You can get online driving directions. Plenty of free parking and come early to enjoy the concessions area with cabaret style seating. This one runs about 2 hours, which includes an intermission.